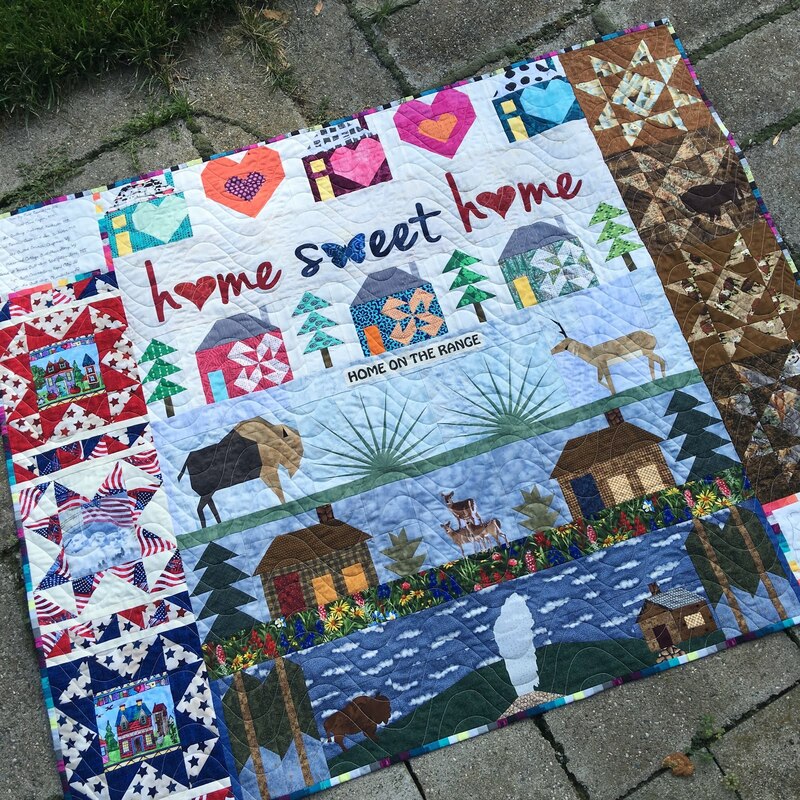 Grace and Peace Quilting: American Swedish Institute and Row By Row 2016, Finished! 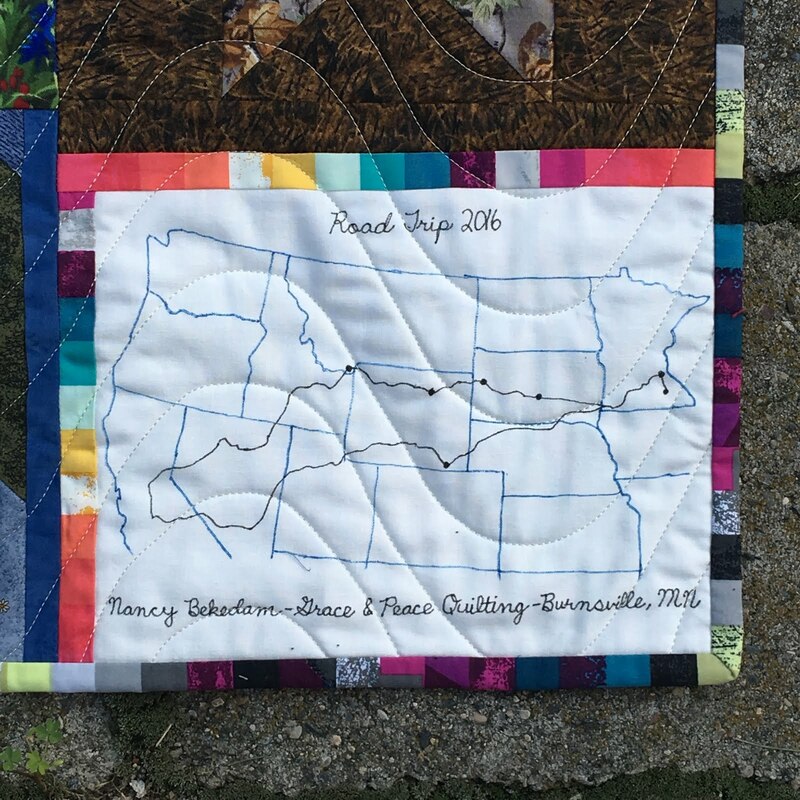 American Swedish Institute and Row By Row 2016, Finished! Thank you to all who came to the American Swedish Institute in Minneapolis to see my trunk show!!! I'm honored that so many came out. 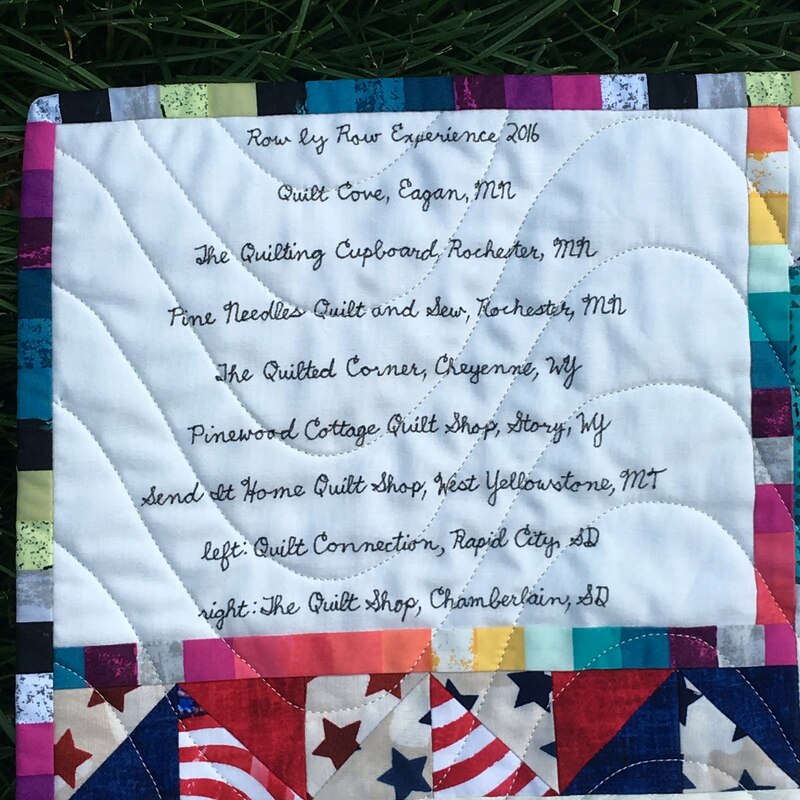 I had 24 quilts with me that day. This year Minnesota Quilters is joining with the American Swedish Institute to have a summer of quilting from June through mid October. My trunk show, along with a number of others, is part of this. I brought my finished quilt in to Pine Needles Quilt & Sew in Rochester, MN, to be their shop winner. Their row is the third one down, with the pine trees between houses. The theme this year is "Home sweet home." I was awarded this 25 fat quarter bundle--oranges, yellows, reds, greens and greys. Very modern! And a charm packet for having their row in my quilt. It's hanging over my desk now, a fun memento of our summer vacay. Wow! You got that done so fast! Congrats on a wonderful finish and an exciting prize to go along with it. Thank you, Bernie! It took me 3 weeks. And yes, I love the FQs from Pine Needles! 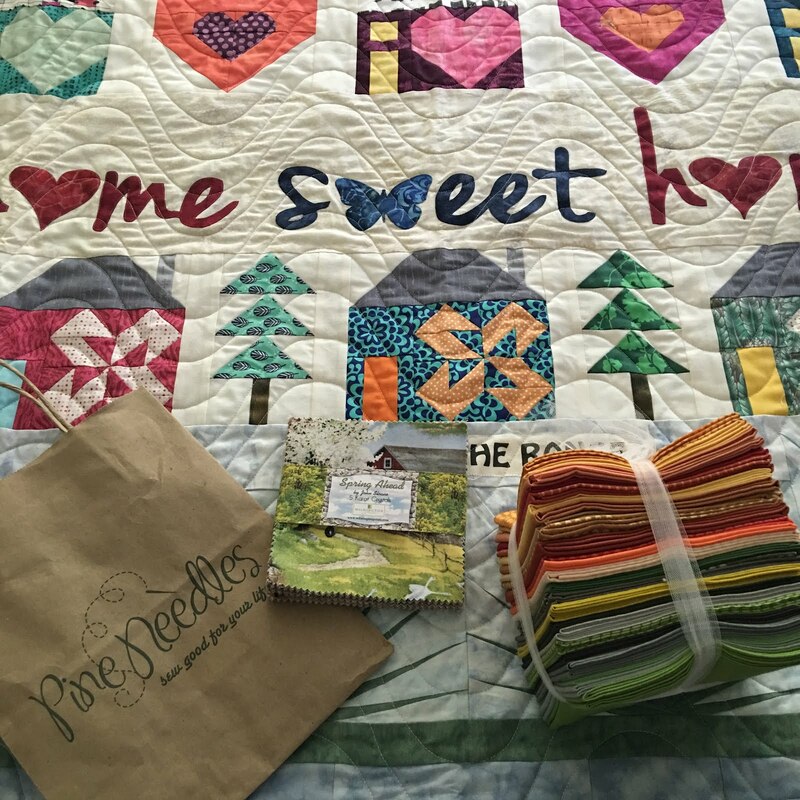 So not only are your quilts awesome-so are your labels! Love the one that shows your trip route. Very nice! Sorry to have missed your trunk show-looks awesome! Thank you, Kathy! YOUR quilts are awesome!!! I am impressed by everything about this! What a great memento! Thank you, Janice! It does remind me of the many little events and stops of our road trip this year. Heading to minneapolis this week ; ) I think you just put ASI in the itinerary! I highly recommend it! Lots of fun quilt things going on there right now, as well as seeing the mansion and hearing the history behind it. Hope you made it there, Tammy! My friend Miki is giving a trunk show this Wednesday, September 14th, at 6:30 pm, so I'm looking forward to going again. 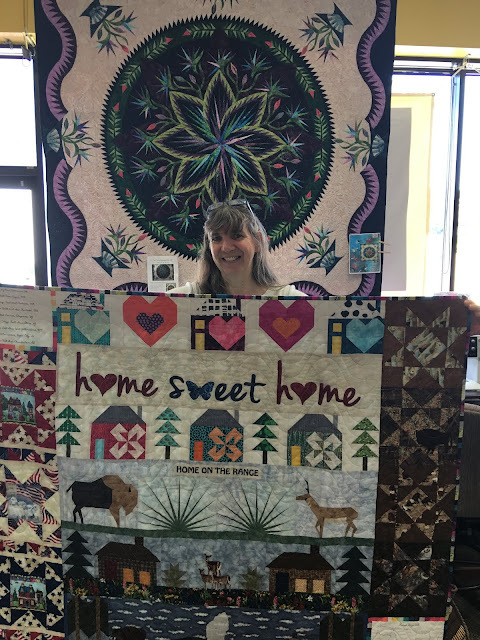 Your lone star quilt is gorgeous. I really love your row by row quilt. It's beautiful!! Thank you, Ariane! 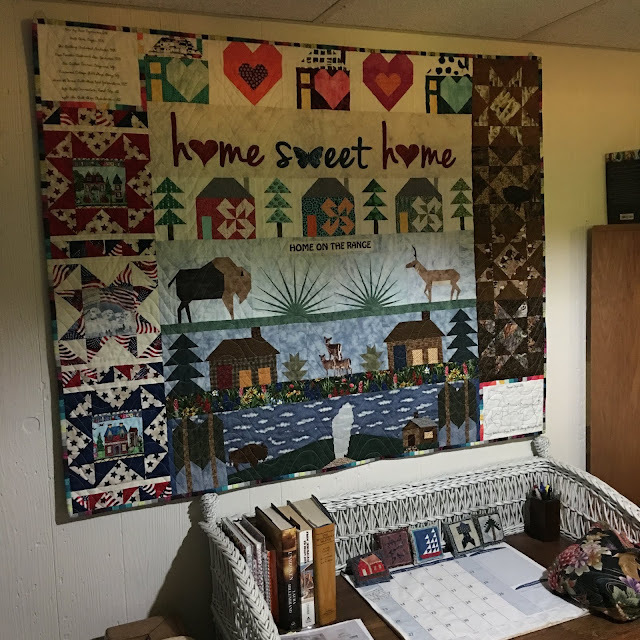 That lone star quilt ended up used as a tablecloth under some Star Wars things at the state fair! I wasn't offended--just thought it was kind of funny! And the Row by Row--it's just too much fun collecting them all!